Though I can’t say what it is yet, I have new research developments that are very exciting. The similarity couldn’t be more striking. There is also an Italian scientist named Olinto De Pretto, an industrialist from Vicenza, who also published the equation `E=mc^2` in a scientific magazine called Atte in 1903, three years after Henry Poincare, and two years before Einstein. So it can be said unequivocally that the mass-energy equivalence equation was not discovered by Einstein, but that doesn’t mean Einstein didn’t contribute to the relation. You see, his work with SRT gave context to the relation that didn’t exist prior, and more importantly, `E=mc^2` is derived as a consequence of SRT equation which further validates SRT framework against empirical mass-energy equivalence data. And that’s the truly amazing part of `E=mc^2` from SRT. It is that `E=mc^2` is not discovered in SRT, but is a derivation and validation of SRT. Where `v` is velocity, and `m` is mass. The `x` symbolizes distance. Where m is relativistic mass m’, just for clarity. This equation alone can be used as the relativistic mass-energy-momentum conservation equation. We could stop here. Now the key is to use dimension of the variables, because SRT is about changes to dimension that are measured essentially invariant from an observer in their own inertial frame. Though this equation (10) can be updated to look very closely like equation (4), the context of the terms involved have been lost. Which `m c^2` is relativistic? Notice in (11) and (12) that the terms on the right are object velocity dependent, while the term on the left is a representation of constant c.
Notice the resemblance to equation (10), but this time it gives a better context to which terms are constant and which are not. The term on the left `m c^2` is using constant c, meaning that mass in that term cannot be constant. It is variable. The first term on the right `m (c’)^2` is using relative c’, which is still measured as constant c in the moving inertial frame, but it also does mean that the associated mass is moving also, meaning that mass is also not constant. Essentially neither c’ and m in this term are not constant. They are both variable. Therefore taking the dimensions of both terms, where c’ = velocity = v, and m = relativistic mass, we can substitute these variables, which is done in equation (15). The last term on the left `m v^2` has without doubt a variable velocity v, meaning that mass in that term is constant, that this mass is the initial inertial mass of the object at `v = 0 [m/s]`. Where `E_k` is relativistic kinetic energy. This equation (17) is the full mass-energy-momentum conservation relationship where `E=m_o c^2` is only part of. As you can see, there is much more physical context given. And there you have it. Even if the object isn’t moving, it still possesses immense internal energy. The total relativistic energy is a sum of kinetic and stationary inertial energy. To know the kinetic energy, total energy, or stationary inertial energy of a mass, you can use this equation. Validation of `E=mc^2` is best done where quantum particles with mass are transmutated into particles without mass but possessing energy. In pair-annihilation, two particles, electron and positron are merged and annihilate each other producing two photons. Again, essentially equal with a marginal difference of 0.1%. The reverse creation pair-production process yields an electron and positron from one photon with the same energy matching the fermionic masses of the electron and positron. I wrote an insightful short book on Norse myth and ancient Mesopotamia back in July 2014, and then archived/shelved it thinking it was complete “enough” so I could enjoy the Summer and focus on other things, but I ended up continuing until this year. I finished the updated version of my book (version 2 technically). I believe it will definitely interest some people. Any Lord of the Rings fans? Any Norse mythology fans? This work brings many myths down to Earth giving them a previously unknown plausible reality while keeping them still fantastical. What really happened to the gods? What really were the Nephilim? Researching and writing this was very enlightening for me personally. I didn’t start it as a serious work, more of a leisurely pastime exploring something that had been on my mind for awhile, one of those hunches, but in the end it became something rather compelling and serious for me as the dots started connecting. The way I see it, of the sciences, physics is perhaps the most fundamental, which is why it intrigues me beyond measure, but there are other fundamental aspects of human existence that lay somewhat outside the natural sciences, like our history. This is why history interests me. Undeniably, the application of science in history research is paramount, but precarious when it comes to historical context and interpretation. This requires we continually question our assumed factual beliefs, that we “not become enthusiastic for the fact, the knowledge, the absolute truth of the day, but remain always uncertain.” This is what I hope my book helps others to explore given its specific subject matter. In my last blog post, I gave my reasons for supporting Einstein’s theories irrespective of alternative or mainstream beliefs (everything should be questioned and not blindly followed). In that post I also elaborated on the underlining mechanism that derives the phenomena that Special Relativity and General Relativity Theories mathematically map as expressed in my own work (Fractal Scaling Cosmology, GPRA:REPMES:FSC). More recently I posed a question to another independent researcher/scientist of “What the Special Relativity (SRT) Lorentz Factor physically represented?” The Lorentz Factor in SRT initially mapped theoretically a unique dynamic of travelling through space that was required to resolve the disparity between Maxwell’s framework and the constant speed of light irrespective of light source velocity. Specifically it was the ingenious application of time dilation with the Lorentz Factor that resolved this disparity. Latter this SRT Lorentz Factor dynamic, or more correctly, this physical phenomena, was confirmed in numerous experiments as particles became harder to accelerate to higher velocities nearer to c (in particle accelerators). So what causes this phenomena that SRT Lorentz Factor (Lorentz and Einstein) so famously mapped at the beginning of the 20th century? As an aside, many people are not aware this is an actual physical phenomena, and/or somehow never disassociate it from the theoretical nature of Special Relativity (SRT), as if SRT produces this phenomena. SRT does not produce this phenomena, it only predicted it. In answer to this question of what the physical representation of the SRT Lorentz Factor is, in my last research book (identifier GPRA:REPMES:FSC 2012/2013) I research and explore the REMARKABLE similarity between the drag-coefficient in a fluid/gas at Mach 1 and the Lorentz factor curvature found in LET and SRT; specifically the portion of curvature upto velocity c. Making this connection was extremely insightful. I shared this info sometime ago in a discussion email forum (in reference to my research found in my book). If the two curves are a result of a similar type of dynamic, this explicitly means mass increase in SRT is NOT solely attributed to “pushing” against/through the space-time medium (the modern non-classical aether) and solely experiencing drag as some have proposed (including myself), because that doesn’t explain the constancy of velocity through empty space after acceleration as this would require the space-time medium to be essentially friction-less (no viscosity at low velocities). Some of these premature propositions of aether dragging causing the Lorentz Factor curvature do not speak to the attributes of space-time that are REQUIRED to match this measurable curvature. Space-time is essentially friction-less, which along with GRT’s description space-time describes a **non-dispersive friction-less super-fluid**. This description is not the classical aether. Aether theories are not all the same and do not all suffer from the same ailments, but there is a distinctive line between classic and modern aethers. For example, between Robert Boyle’s, Maxwell’s electromagnetic field and the more modern Einstein’s GRT space-time continuum, SVT’s superfluid medium (inline with GRT), and even to an extent the Higgs Field. To highlight the need for an explicit description of this modern space-time aether medium in order to avoid ambiguities with erroneous classical models of the aether, air resistance applies to all velocities where space-time medium resistance appears to ONLY apply to velocities nearing c, because my research suggests that the space-time medium’s drag-coefficient changes when nearing those velocities, similar to physical fluid/gases. This doesn’t speak to the fact that space-time medium’s resistance increases proportional to acceleration (as described in GPRA:REPMES:FSC). 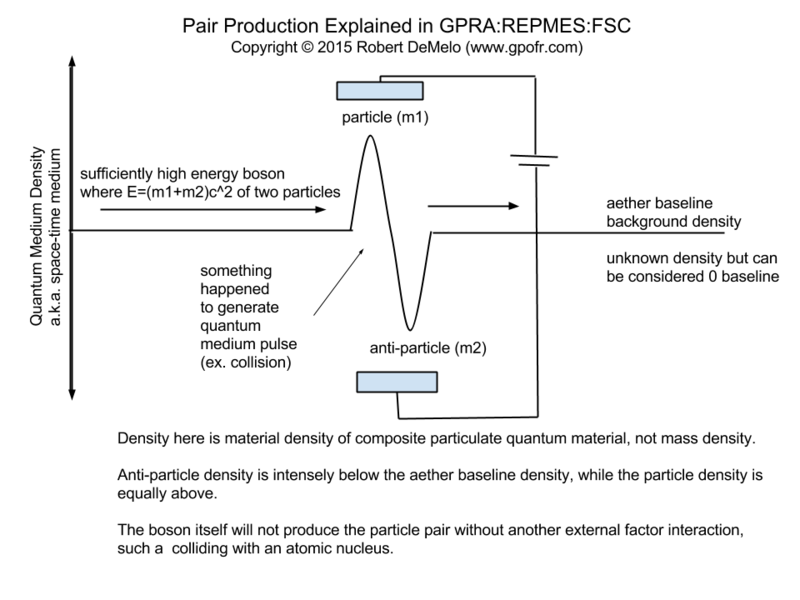 If the Lorentz Factor curvature is a result of a similar dynamic that causes drag-coefficient curvature near Mach 1, this means that this curvature is caused by an inherent property found in fluid-type mediums in which objects travelling in them approach the non-dispersive fluid’s wave velocity changing the fluid’s “viscosity” at those near c velocities upon the object. Furthermore, AND MORE IMPORTANTLY, this insightful connection between the SRT Lorentz Factor curvature and the Mach drag-coefficient curvature also STRONGLY predicts/suggests the Mach 1 light speed c is not a hard velocity limit at all if fractal self-similarity applies to the space-time aether (quantum medium as explicitly described in FSC). FSC strongly suggests velocities beyond c are very real, exist and are achievable. This insightful understanding upon this dynamic also reveals something about relativistic mass. 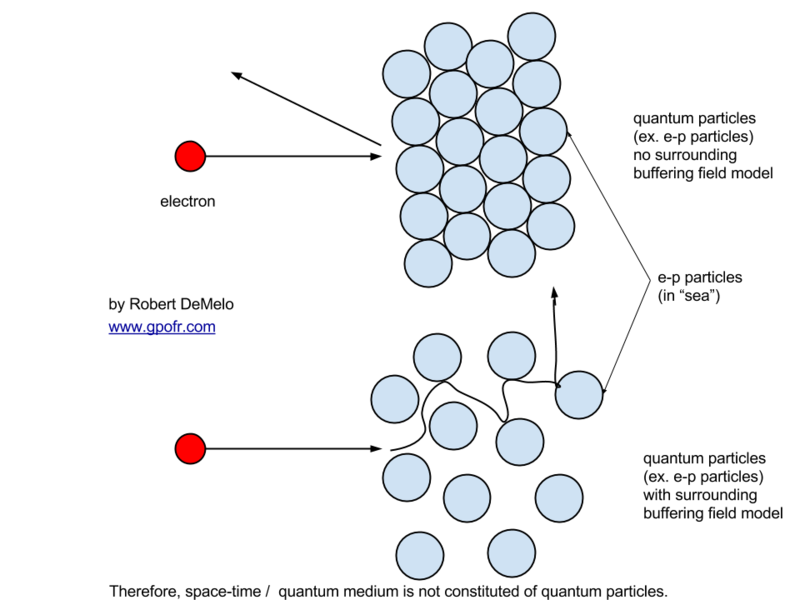 Mass increase as described in SRT is based on apparent mass and not rest mass which remains the same at any velocity (if the observer travels parallel to the object). As an object is propelled by an artificial mechanism (ex. rocket) using natural forces (electric, magnetic), as the object approaches c of the medium, the mediums drag-coefficient increases changing the state of the medium’s friction-less viscosity making it more difficult to push the object therefore requiring more force applied. That increased applied force is where the extrapolated *apparent* mass is derived from. It’s simple and simple math and doesn’t only apply to the theoretical aether, but all fluids of which gas and solids are still at different bulk modulus through temperature. The *measurable* mass (apparent mass) changes with velocity, but I stress this apparent mass is relative to the observer’s own velocity, so a moving mass as measured by two differently moving observers will not measure the same. 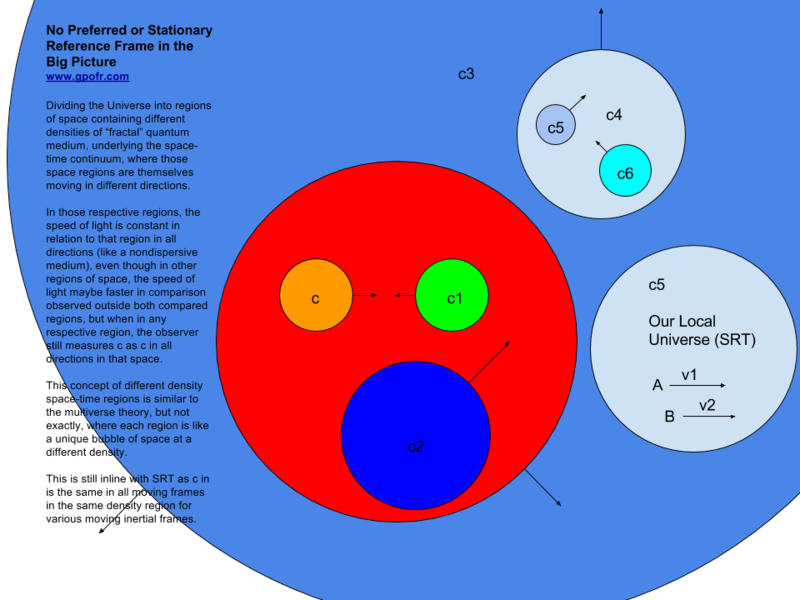 This two observer scenario is difficult to reproduce, but in a particle accelerator, the single observer scenario is very real and has been verified. Particle accelerators use an electrostatic field to attract or push charged particles. The electrostatic field strength on a charged particle is 10^39 times stronger than gravity. Gravity propagates at c though the space-time medium. If the particle accelerator were to use gravity alone to accelerate a particle, it would never reach c due to the gravity field propagation matching parity at c with the particle’s velocity if the SRT Lorentz Factor effect is ignored. The electrostatic field is again 10^39 times stronger than c. There is no shortage of force to propel a charged particle. In addition, in my own work in fractal scaling cosmology (FSC), fractal self-similarity predicts that the electrostatic field is self-similar to the gravity field but propagates much, much, much faster than c (9×10^16 m/s as per FSC). In both cases, electrostatic field would not meet parity at c, so when a particle becomes more difficult to accelerate near c, it’s not due to a lack of strength or speed from the propelling mechanism. I know Einstein is correct when it comes to his less than fundamental theories because of the SRT Lorentz curvature matching Mach speed drag-coefficient curvature (as per my GPRA:REPMES:FSC work), and due to his ingenious topological (high-level, non-fundamental) GRT gravity theory. 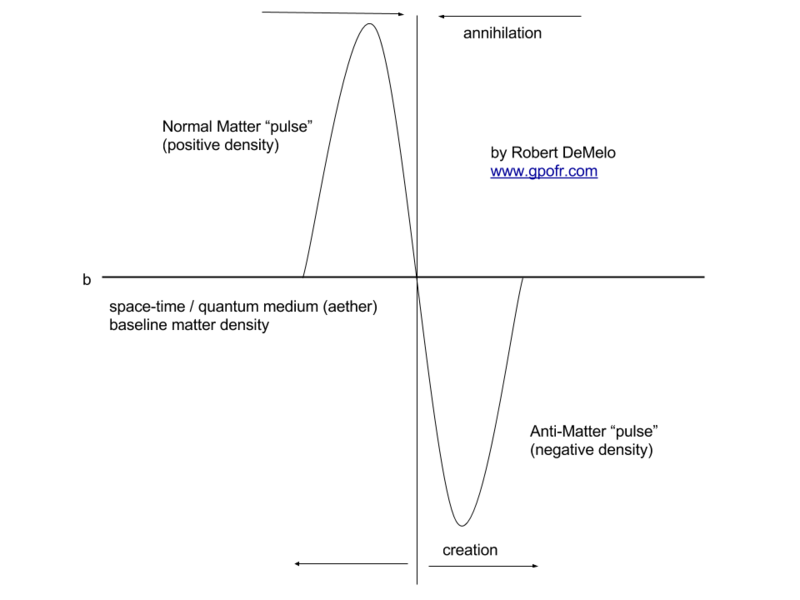 Propositions and arguments that use an arbitrary “classic-type” aether in place of the more modern space-time continuum model (new aether) and then claim that the aether causes apparent mass increase due to an aerodynamic-type of mechanism while adamantly insisting or suggesting Einstein’s SRT is incorrect though it uses the Lorentz factor (which is applied correctly) and matches empirical data is completely illogical given the insight described above between SRT Lorentz Factor curvature similarity to Mach drag-coefficient curvature. Essentially, Einstein is describing in mathematical terms what the aether argument applying drag is explaining BUT in a friction-less super-fluid without the explicit reference to such a medium. The two arguments (pro classic aether and pro space-time continuum) are not mutually exclusive (there are no sides in proper science). The grounds upon which they can meet correctly and explicitly MUST match empirical data, and there is a narrow corridor for this deterministic aether unification with the more modern space-time continuum as described in my research in FSC. Due to increased popularity with the aether concept in recent times, arguments of whether Einstein is wrong with SRT or GRT is irrelevant when it comes to the measurable phenomena that these theories describe. The argument that should be argued and advanced of SRT is what causes the SRT Lorentz curvature physically real phenomena? SRT itself doesn’t explain the fundamental why. It doesn’t explain the mechanism underneath the dynamic mathematically mapped in SRT, but LET does to a degree. SRT, as GRT, is NOT a fundamental theory. These theories, like many theories in science, are topological (high-level), a mapping of a measurable dynamic, or in Einstein’s time, the only explanation to the disparity between Maxwell’s framework and the measurement of the speed of light irrespective of source speed, which turned out to be correct on several aspects (research supporting experiments). Einstein undeniably based his work off LET. LET is undeniably an aether theory, therefore Einstein’s use of the Lorentz factor indirectly introduces an “aether” medium into SRT even though it did not explicitly mention it (see Aether Theories). The difference in SRT and LET aethers is that the SRT aether is indistinguishable from the experience of space, while LET’s aether was classical and theorized to be separate from the experience of space (immovable), and therefore could in theory be detected and measured. GRT nailed this fact home with the space-time continuum. Knowing this about Einstein’s SRT and GRT, scientists (independent and not) could REALLY start to advance science by looking at the fundamentals of nature that give rise to SRT and GRT models and the phenomena they explain. For example, the space-time continuum isn’t as fundamental as it could be. The SRT Lorentz factor curvature doesn’t explain what causes it, and GRT doesn’t fundamentally explain what exactly is “curved” space (see Schwarzschild solution) or what causes “curved” space. The space-time continuum doesn’t describe its intrinsic, constitutional physical nature at the quantum and Planck scales (or smaller as predicted in FSC). SVT (superfluid vacuum theory) attempts to explore and explain this more fundamentally yet it’s still not fundamental enough. This is what I’ve been doing with fractal scaling cosmological framework (FSC) because the framework is extremely fundamental. In fact, FSC CANNOT be more fundamental by its very nature. But this advancement in science will never happen if scientists (independent or mainstream) are too married to their deeply ingrained beliefs (conservative or the other) or the systems these beliefs uphold. In addition to these fundamental explanations that are missing from SRT and GRT, which if explained would advance science beyond SRT/GRT (not prove them wrong, but only incomplete), there are legitimate problems with SRT and GRT that if answered would also advance science. 1) Is the light speed limit assumption correct? It was an assumption, and the lack of evidence for superluminal speeds isn’t evidence against it. Quantum entanglement is faster than c by upto 10,000 times (if not more). Also the Lorentz factor curvature matching the Mach drag-coefficient curvature (as described in GPRA:REPMES:FSC) strongly suggests that superluminal speeds are very real IF repeating fractal self-similarity in nature is real (nature is undeniably fractal so it isn’t a far stretch). 2) What is causing the spiral galaxy velocity curvature? GRT requires Dark Matter to explain it, again on a more topological level (high-level). The composition of Dark Matter hasn’t been discovered yet. In my research in FSC, I suggest that Dark Matter and Energy are related to the explicitly defined fractal quantum medium (QM) decribed in FSC. If correct, this would mean that no detectable *invisible* quantum particles will be correctly discovered in attribute to Dark Matter or causing Dark Energy. Instead density changes in the quantum medium (ambiguous with the experience of space) would be attributed to this phenomena. 3) What is the space-time continuum? GRT gives a field equation that essentially maps a medium that is pliable, moves, curves and swirls (Lense-Thirring Effect). Similar continuum field equations are used to describe an ideal fluid, which indicates that Einstein modeled the space-time continuum after an ideal fluid, which actually supports the matching Lorentz factor curvature with Mach drag-coefficient curvature (from GPRA:REPMES:FSC), because drag in an ideal super-fluid (SVT) doesn’t really exist (lack of viscosity) but does come into play near c because something in the medium changes at those velocities. 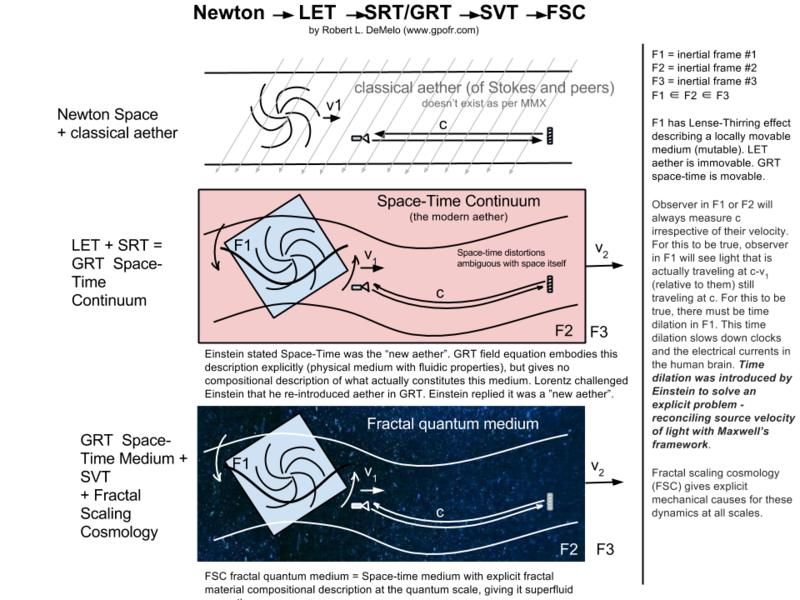 In FSC, the space-time continuum is given an explicit description as the fractal quantum medium (QM), which not only describes the dynamic of gravity but also electric force. There is much confusion around Special and General Relativity. I admit some years ago, at the beginning of my own research into what is currently better defined as fractal scaling cosmology (FSC), I was initially taken in by arguments of dissenting researchers that SRT and GRT were erroneous, because at the time there appeared to be a contradiction between my own work and SRT, but that never sat well with me. I avoided the subject of reconciling FSC with SRT and GRT in favour of bettering my own framework in FSC independently, separate from all external schools of thought, by strictly applying my S scaling factor, and associated transformation equations, to various physical phenomena and testing whether it was correct after application. Part of that research involved projecting Newtonian gravity at the quantum scale resulting in Coloumb’s charge force law (analogical to Newton’s gravity law). This was a very slow process, and it eventually evolved unavoidably into the development of a fractal material spatial medium called the fractal quantum medium (or simply QM). It was only after that development came the day that I had to reconcile SRT and GRT by necessity. What was that necessity? What sparked this reconciliation was that after developing FSC to a specific point, I noticed that FSC core framework had an additional effect on Newtonian gravity. It was an extension on Newtonian gravity by applying FSC’s core framework to classic gravity dynamic. In applying this modification, a new gravity equation emerged that reduced to Newtonian gravity equation, was very consistent with it, but also added an additional effect. 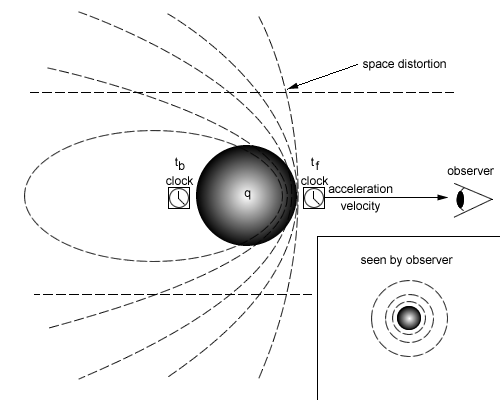 The equation was put into a gravity computer simulation test which resulted in the additional visual effect of orbital precession. Upon seeing this, I had to test the new equation with empirical data of our Sun and Mercury. What resulted was the orbital precession of Mercury precessing by 43″/century. The simulation ran 100 years of Mercury orbiting the Sun by accelerating the passage of time so the simulation took minutes not years. I ran the test many times resulting in the same value. In compound to other fascinating results in the FSC framework (deriving the elementary charge, giving the explicit cause of inertial mass), this for me solidified that FSC was indeed on the right path, or at least it was partially very correct. Upon getting this unexpected result from a framework that appeared at first detached from General Relativity (GRT), it forced me to look more closely at General Relativity. I was most curious was how my own FSC framework and GRT resulted in the same result using mathematical frameworks that appeared fairly exclusive from each other. This bothered me, but my first step was to verify that GRT was indeed correct. This might seem arrogant to some that I needed to verify GRT was correct, but proper science demands no less. You have to question and test everything indefinitely. Ultimately I found GRT correct to a point. One such weakness in the theory is its inability to explain the spiral galaxy velocity curve without the addition of a non-verified dark matter. Another problem is its inability to integrate with quantum theory and mechanics. But given these short falls, General Relativity has proven itself empirically on several aspects. During my studies and research in the history and mathematical framework of GRT, I realized (some time ago now) that the GRT field equation represents a physical medium with fluidic properties. It was this that initially made me very curious about physics as far back as 1992. In fact, the GRT field equation has many undeniable similarities to the “Perfect Fluid” field equation, which makes you wonder if Einstein used the “Perfect Fluid” field equation as the source for GRT’s field equation. This medium was called by Einstein the space-time continuum. The word “continuum” comes from the mathematical framework/language used by Einstein and associates to describe this medium, which is called Continuum Mechanics. Continuum Mechanics is used to describe the embodiment of dynamics of mediums such as water, concrete, and elastic jelly. The GRT field equation describes a medium that can propagate waves and is locally movable (draggable as per the Lense-Thirring effect). What was most astonishing was that GRT was not independent of older theories of a universal aether. Einstein was a big admirer of Henry Lorentz, who with others developed the Lorentz Ether Theory (LET) framework. Einstein used portions of LET in his work with Special Theory of Relativity (SRT) in 1905, but because of how SRT was devoid of an explicit aether as LET had, SRT and Einstein essentially renounced the existence of a classical aether as it was defined at the time. Later upto 1916, he developed GRT incorporating SRT. Upon revealing the GRT field equation to the scientific community, Lorentz challenged Einstein by stating that in GRT Einstein re-introduced the aether (as space-time) he previously claimed to no longer exist. Einstein replied by stating that space-time was a “new aether”. To this claim Einstein is correct. GRT’s space-time medium is not the LET aether. First it incorporates time-dilation which LET’s aether does not, and secondly is it movable while the LET aether is immovable. Either way, what is obvious is that GRT’s space-time has a geometric mathematical representation describing a medium that is physically real in some form. It also describes a medium that is essentially ambiguous from the experience of space itself, mainly due to how it bends light, which is our primary “human” means of observation. What GRT does not describe is what the space-time medium is made of. It doesn’t describe its material composition. Because of this lack of description, GRT has problems reconciling with Quantum Mechanics. This is where FSC comes in with a very explicit description of the this space-time medium, which is called the fractal quantum medium for very just cause, but this is getting beyond the current subject. GRT also lacks the description of why it appears not to impose drag on objects moving at a constant velocity, and it lacks the description of what exactly space-time curvature/distortion physically represents and how exactly curvature is caused by the introduction of a mass object. Like SRT, GRT lacks deep underlining mechanistic causes for the effects and dynamics it maps. This is where Superfluid Vacuum Theory (SVT) was introduced back in 1952 in the form of Bose-Einstein Condensate (BEC). SVT attempts to gives mechanicals causes to the what GRT embodies in the space-time medium, and in so trying, it also tries to unify GRT with Quantum Mechanics. In my opinion, it does a good job to a degree but ultimately fails. SVT embodies many older aether concepts, such as LeSage’s mechanistic gravity cause, but in a different language. SVT explicitly describes GRT as a fluidic medium with superfluid properties while giving more underlining causes, while GRT field equation describes essentially just a fluidic medium without giving underlining causes. FSC gives very explicit underlining causes for most dynamics space-time is attributed with, such as gravity. FSC breaks it down to the quantum scale. For proponents of classic LET (and I admire LET framework for its connection to GRT space-time), LET was never expressed in continuum mechanics, as far as I know, but GRT definitely was. This means that GRT space-time “aetheric” medium has a better explicit description of its physicality than LET aether ever had. LET is the more explicitly obscure aether medium between the two, therefore most prone to erroneous interpretations. Math is a very explicit language. Also GRT space-time is movable and LET ether is immovable. LET was primarily expressed as an alternative to SRT without time dilation using instead size/length contraction as a means to reconcile light source velocity with Maxwell’s framework. GRT incorporates time distortion (and length contraction) which is proven without any doubt that a gravity field affects time. How it affects time, the explicit way, maybe questioned. LET has no such description of time dilation. Time dilation was Einstein’s primary contribution. Also c=1/sqrt(ue), where u is the vacuum permeability (or magnetic constant) and e is the vacuum permittivity, which means many scientists are fully aware that light speed is dependent on the intrinsic properties of the spatial medium (space-time continuum). Gravity as a push effect by the spatial medium is described by GRT explicitly if you take Schwarzschild solution and apply it in 3D geometry as a pressure-density gradient producing force (gravity). And to answer the question of if space-time is a physical medium, a fluidic solid of sorts, why doesn’t it stop physical mass objects from moving inside it? Because it has super fluidic properties. GRT expressed no frictional aspect but did express space-time “curvature” generating force. Friction/drag is also a force.